By their nature, they are rapid, free hand. They are used to give the artist a beginning, the base for their work. In this post, we will explore the quick, the incomplete, the ideas given form on the paper. Join us as we thrive in sketches! 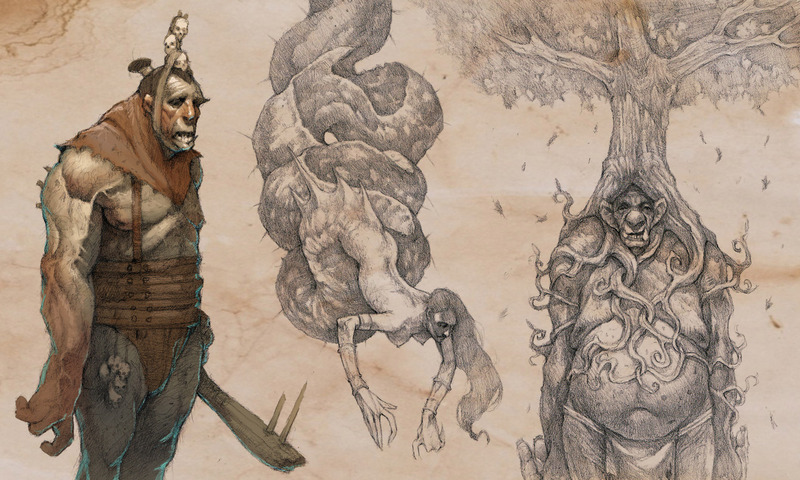 Some examples of artists using sketches to reach their completed art. Balali is no stranger to Artlords. However we shed a spotlight to his many sketches in this post. Notice how the use of color makes these rapid drawings come to life. Notice these aren’t “pure” Sketches, there has some post-production here, with colors and form. Yet John was kind enough to let the sketch marks he had for the heads to show up on this step of the work, giving us insight into how he pulled this off. Now, this is more of what you have in mind when it comes to sketches, BRINIS puts the focus on speed and shapes for this series of work. With a name like “Eldrige”, monsters is what you expect. And these sketches deliver in spades! And we finish here with Figini’s attempt of putting to the pen a whole universe of characters, sketchy style.